Basement finishing is always an effective home renovation approach, and is especially useful when building an addition or enclosure on the house is not possible. If you need additional living space but the first floor of your home is already crowded and there�s no place to build out, building down is an option you shouldn�t overlook. If your basement is dirty and dingy � a place for utilities and storage and not much more � you�ll be surprised at the comfort and style your basement will afford when David Fabbo gets done with it. When the David Fabbo builders complete your basement finishing work, you�ll be so pleased you�ll wonder why you didn�t consider basement designs the minute you moved in. Your David Fabbo representative will visit your home, look over your existing basement, discuss your basement finishing ideas with you, and help you plan your basement remodeling. 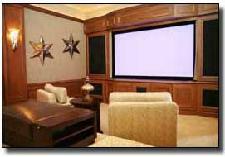 As you work with your David Fabbo representative, you�ll begin to think about your basement differently. If your basement use has been limited to housing the furnace and hot water heater, doing the laundry, and storing old equipment and out-of-season sports gear, you�ll need to imagine your basement as a living and entertainment area for family members that might include sleeping accommodations and possibly bathroom and kitchen facilities. Your David Fabbo representative will help you identify the specific needs you want your basement remodel to address and will help you determine the scope of the home improvements you should consider. Dampness must be addressed in the finished basement. In New Jersey, basements are known for being damp, inhospitable places. Because basements are typically surrounded by moist earth, interior dampness is a common problem. Laundry facilities located in basements add more moisture to the downstairs space. Before beginning the basement remodel, David Fabbo will identify waterproofing work that must be completed, as well as interior cracks, exterior grading, or other problems with the house�s foundation that need to be fixed before the home improvement work can begin. Your David Fabbo Home Improvement representative will also check your home�s eaves and spouts to confirm that rain and melting snow are being adequately directed away from the house�s foundation, to cut down on the moisture settling around the basement walls. Making sure your basement is adequately waterproofed is a prerequisite for any successful basement renovations. Basement remodeling must include adequate egress. Fire safety standards require an egress window or another way for adults and children to exit the basement. Your David Fabbo Home Improvement representative is familiar with these building code requirements and is prepared to include an egress window or another exit in the basement designs that�s large enough and positioned appropriately, to meet your area�s building code requirements. Basements require adequate headroom. In most basements, the ceiling beams, pipes, ducts, and wiring are in full view overhead. When a ceiling is installed to cover them up, adequate room is needed between the floor and the new ceiling so that adults can stand and move around comfortably. Your David Fabbo Home Improvement representative has the know-how to complete the measurements, estimate the clearances, and accommodate these needs in your basement renovations. Basements must have adequate plumbing and drainage. If bath, toilet, shower, whirlpool tub, or other spa facilities will be added that do not now exist in your basement, your David Fabbo Home Improvement representative will assess the adequacy of the current plumbing and drains in the basement and draw up plans that will accommodate the added demand. Basements need finished walls. Basement walls in older homes often consist of the foundation�s concrete blocks covered with paint. Your basement remodel requires finished, framed walls that make your new downstairs room feel like an upstairs room. You David Fabbo Home Improvement representative will plan to frame not only the basement walls but also the columns and pipes often located throughout the room. Lighting sets the right mood in your basement hideaway. Whether you prefer recessed lights or track lights or another style entirely, your David Fabbo Home Improvement representative can show you many different lighting options � including wall sconces and under-the cabinet lighting � that will create the mood you�re looking for in your new downstairs room. Flooring adds warmth and texture to your basement design. Your David Fabbo Home Improvement representative will suggest a variety of flooring options that look good in your room, provide warmth and comfort, wear well, and resist moisture, and that can be easily cleaned and maintained for years to come. Kitchen and bar additions add flash and function. With a larger home remodeling budget, your basement designs can include a kitchenette, complete with appliances and a bar for easy serving and light meals, handy for entertaining on holidays and game days. Fireplace options are available in your basement remodel. There�s nothing like gathering around a cozy fireplace on a winter day. Your David Fabbo representative can show you various fireplace designs that will turn your basement into the best place in the house to relax in front of the fire as the snow falls outside. 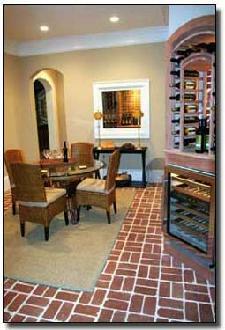 Other d�cor selections will complete your basement designs. Your David Fabbo Home Improvement representative will suggest a variety of d�cor options for wall coverings, storage cabinets, hardware, and other d�cor items that add to the look and functionality of your new room. Once you and your David Fabbo Home Improvement representative have finalized your plans for your basement renovations, your David Fabbo representative will Estimate the cost of your home improvements and give you an itemized list that outlines the required materials and labor. You and your David Fabbo representative will review the estimate and confirm the scope and costs of the project, based on your budget and your priorities. If you decide to complete the project in stages, your David Fabbo representative will develop a home improvement plan that can be completed in phases. will develop a payment plan that works for you. If you need help with financing your basement renovations, David Fabbo Home Improvement can refer you to one of several home financing companies we work with. For your basement renovations, your David Fabbo Home Improvement representative works with you and with the David Fabbo builders to carefully plan every aspect of your basement designs before the work gets underway. Since basement remodeling may involve plumbing, heating, waterproofing, and other work, your David Fabbo representative will consult with the David Fabbo builders to make sure your basement designs take all these needs into account. Your David Fabbo representative will work with you on the budget required, the availability of financing, permits and building code inspections, and will answer your questions and concerns as the work progresses. With nearly 22 years in business as a home remodeling contractor, David Fabbo Home Improvement has the experience and know-how to assist you throughout your entire basement remodeling project. The reason we�ve been in business so long is because our loyal customers keep coming back when they�re satisfied with the work we do for them. The primary goal for David Fabbo Home Improvement in any home renovation project is that you are satisfied with your home improvements after the work has been completed. As one of the leading home improvement contractors in New Jersey, David Fabbo Home Improvement�s future depends on our current customers returning for additional work and referring their family members and friends. David Fabbo Home Improvement does everything we can to ensure that you�re satisfied with your home renovation, because we want to keep you coming back for years to come. At David Fabbo can meet all your home improvement needs. to set up a meeting and get an estimate for your job.